University is like a sculptor’s studio, where students are modeled and chiseled, gaining professional knowledge. But the knowledge there is mostly theoretical. Sure, they know the ‘what’, but the ‘how’ is learnt in the real-world. It is in the industry that a newly minted professional puts their theories to test. What today’s students need is a stepping stone as they crossover from being a student to a professional. As John Keats wisely said, “Nothing ever becomes real till it is experienced”. 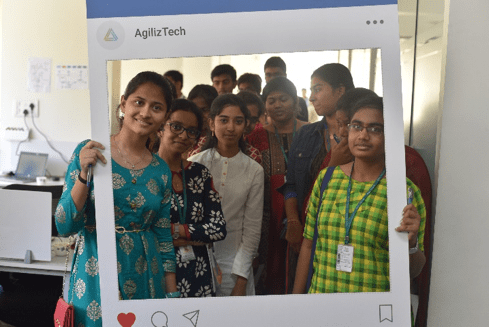 AgilizTech recognizes this a gap, and hence conducted a one-day industrial visit for the students of PSG College of Technology, Coimbatore, on February 4, 2019. 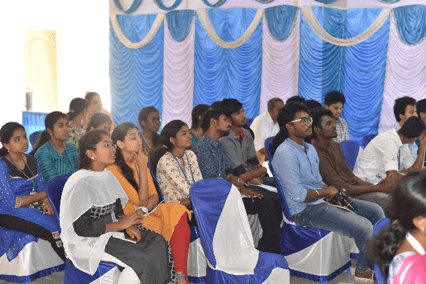 With an aim to go beyond academics, this industrial visit provided students a practical perspective on the world of work, an opportunity to learn practically through interaction, and an exposure to current work practices. The event kick-started with a briefing on the nature and purpose of the visit. 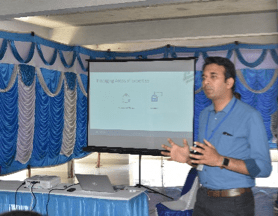 This included a short introduction on AgilizTech by Sujeeth Shetty, VP – Business Development, AgilizTech. 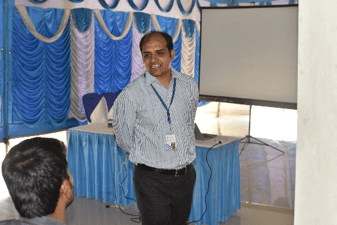 Next, V Ganesh Babu, MD and CEO narrated the AgilizTech journey, spoke about his experiences and touched upon today’s IT trends. 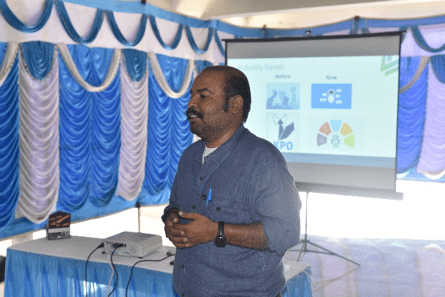 Following this, Anand Gangoor, Senior Technical Delivery Manager, AgilizTech, talked about the various teams that work together to develop a software application. He also explained the same with a practical example . The students were divided into batches of 20 each. 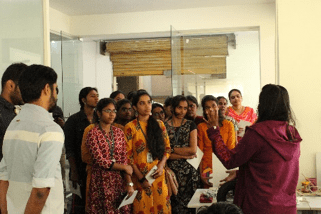 Each batch moved around the office for interacting with the various teams and understanding how they operate. 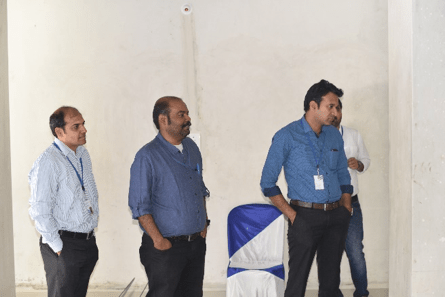 While one batch was visiting the work area, the rest had an open Q&A session with Anand and Sujeeth, clarifiying their doubts about how the industry operates and what it takes to plunge into entrepreneurship. 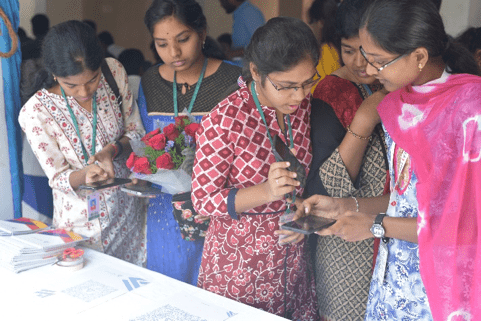 To propel students into thinking mode, a Logical Puzzle solving contest was handled by Thomas Linson, Senior Software Engineer, AgilizTech. A fun way to learn more about IT, the students showed keen interest and actively solved the puzzles given to them. During the visit, the students also visited our photo booth to capture memories of the visit. 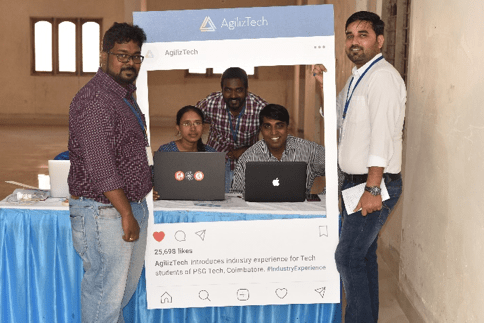 “We had a great time at AgilizTech and the reason was most of the time it was an interactive session. 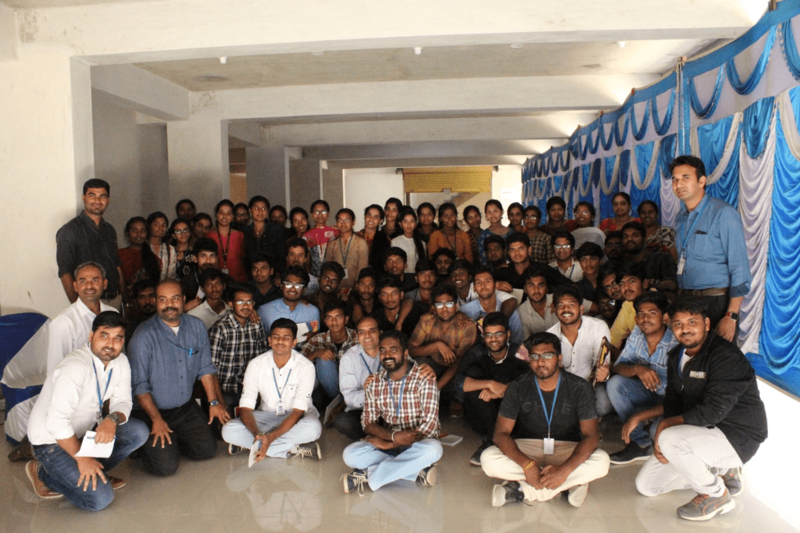 We got an overall view regarding startups as well as the difficulties to be faced by an Engineer. 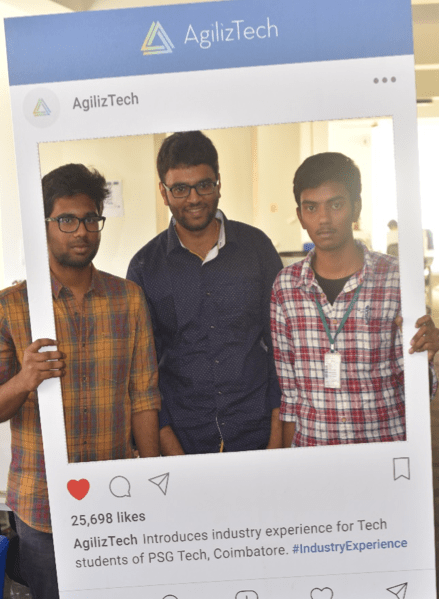 The main thing we appreciate about AgilizTech was the way you encouraged the volunteers which boosted everyone’s confidence. According to recent surveys, one of the biggest causes of concern across industries has been the skill-gap prevailing across our country. 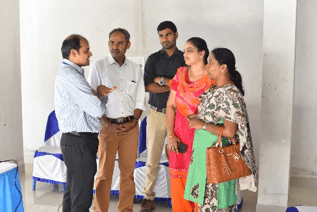 Conducting such industrial visits offers students the opportunity to learn more about the industry and sharpen their skill sets accordingly. Yes, it is Christmas season – a festival of happiness, love and peace. 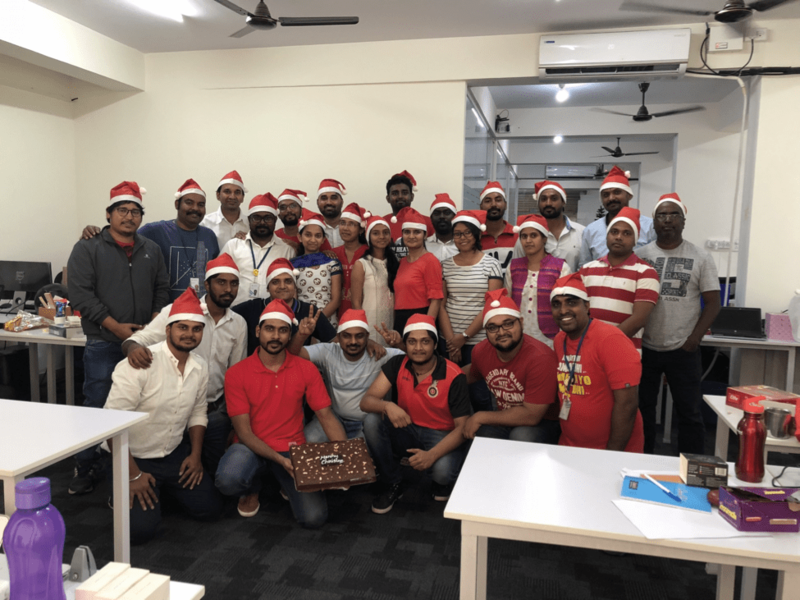 And Team AgilizTech was no exception in celebrating this wonderful festival with great pomp and joy on Friday, 21st December. 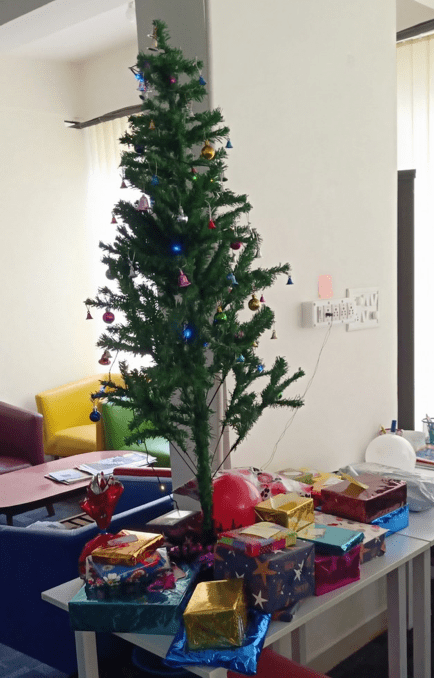 Organized and hosted by the AgilizTech Fun Committee, the day was made very colorful and joyous by decorating the workplace with a beautiful Christmas tree with gifts beneath, colorful balloons, and wreathes with bright decorative bulbs. The entire team was divided into two to play some fun-filled games which reminded us our childhood. The winning team was rewarded with delicious chocolates. What is Christmas without a fun game of Secret Santa? 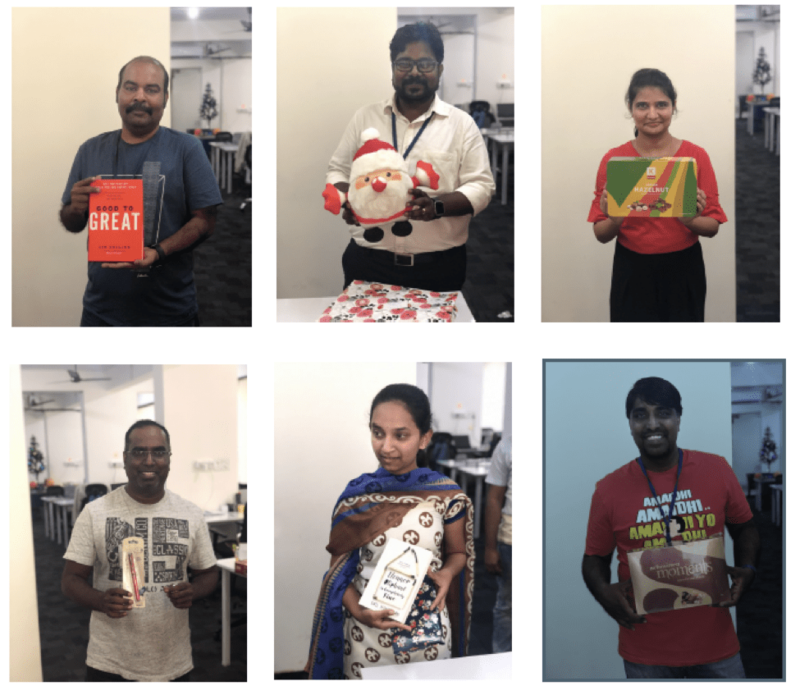 Everyone at AgilizTech indulged in a gifting spree by being Secret Santas. It was a gleeful exchange of presents under the Christmas tree that united the team as a family and brought us all closer. 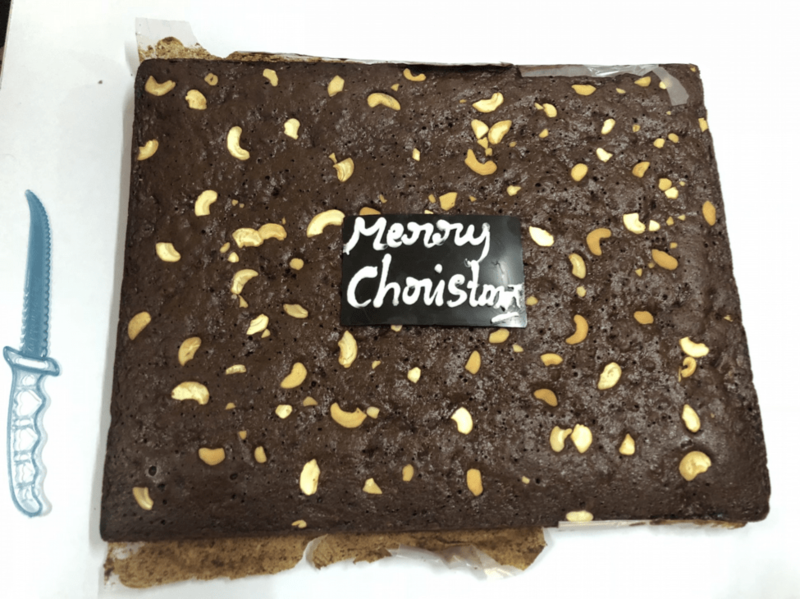 A Christmas celebration is incomplete without a cake, and we were all eager to devour the delectable cake. May the joy and peace of Christmas be with you all through the Year. AgilizTech wishes you all a very happy and joyous Christmas and New Year. It is that time of the year again where houses are decked with lights, the smell of delectable sweets and savories is in the air, and joy and festive spirit is in the hearts of everyone. Yes, it is Diwali time. AgilizTech celebrates the victory of hope over despair and good over evil every year with great gusto, and 2018 was no exception. The team had a gala time indulging in festivities on Friday, 02 November. 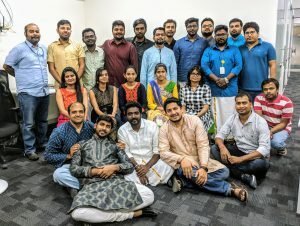 Hosted by the AgilizTech Fun Committee, Diwali 2018 witnessed the team participating in the festivities by decorating the workplace. A beautiful traditional rangoli was drawn at the foyer, welcoming everyone cheerfully with its bright colors. A special dress code had been announced for the team with prizes for the best dressed. The first event of the day was the team reminiscing their favorite Diwali moments. Mr Ganesh, MD & CEO, spoke about how Diwali meant new clothes, the exciting thiruvizha (village fair), the thrill of bursting crackers and delicious sweets made at home. Other team members also spoke about what Diwali signifies for them and how they celebrated the event with their families over the years. 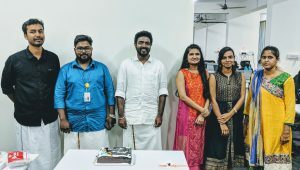 Not just the office, even the employees were decked in their finest traditional attire keeping in line with the dress code, with the competition of the best dressed won by Dinesh and Rajesekaran among the gentlemen and Pooja, Nikitha and Ramyashree amongst the ladies. 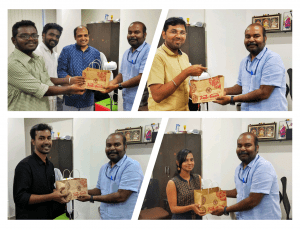 The event ended with Mr Ganesh distributing sweets among the team, along with exchanging greetings and good wishes. AgilizTech wishes everyone a very happy and prosperous Diwali!